What is de Quervain’s Tendinitis (or Tenosynovitis)? 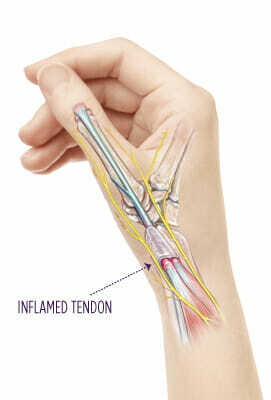 This condition is characterized by inflammation of some of the tendons that extend the thumb. These tendons pass through a narrow, close fitting cover of tissue. The tight space can cause irritation. Once tendons are inflamed, the pain-inflammation cycle can be difficult to overcome without treatment. Inflammation can be caused by a number of things. Starting new activities in which there is significant repetitive motion of the thumb or wrist can cause irritation. Fractures, various types of arthritis, and a tight cast can also predispose you to developing tendinitis in this area. De Quervain’s tendinitis is also very common in new mothers or those caring for very small children. Your doctor may wish to inject a numbing medication into the painful area. This injection is diagnostic and can help formulate a plan tailored to your needs. Once painful symptoms have subsided, your Summit hand surgeon will likely recommend a strengthening exercise program for your thumb and wrist. Your recovery time is dependent on your age, general health, and how long your symptoms have been present. With cases that have developed over time, de Quervain’s may take longer to respond as the disease is often more resistant to change. Summit’s hand care team will work with you to develop a treatment plan designed to get you back to your everyday active life.